I couldn't find much information about it and Monsieur Touton the Importer / Distributor doesn't seem to have any website. However, as always, I will find more info even if I have to phone the winery (it wouldn't be the first time that I'm doing such a crazy thing). Yet I will complete this post with region comments and info soon. However, to get back to the wine, I love this little wine. It is a quaffer, quite simple yet attractive and balanced, fresh and juicy. At roughly $9.99 dollars on the shelf, it is a steal! In the glass, it shows an extremely clear, pale ruby color with low intensity and discreet slightly pink reflects. 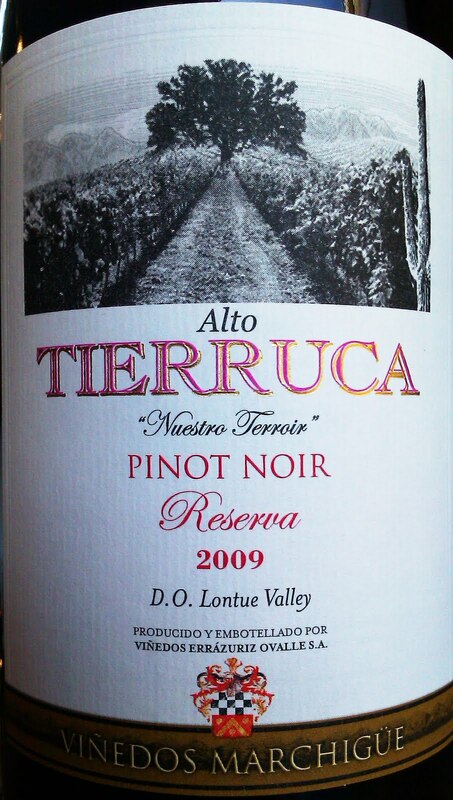 On the nose, the Alto Tierruca Pinot Noir Reserva offers freshly crushed cherry and red berry notes intermingled with light floral earthy notes. The palate has a mineral touch intermingled with lively cherry and earthy flavors. The finish is clean, fresh and simple yet balanced, nicely expanding and focus ‘til the end. This wine is a perfect crowd pleaser. Love it. Enjoy each sip of it as an aperitif or with appetizers, hors d'oeuvres, fresh cucumber and feta salads, goat cheese, grilled fish and poultry and Asian cuisine.